The 10 Best Speakeasies in North Carolina! Prohibition was repealed long ago but there are still plenty of bars in North Carolina that hearken back to that era. From glitz and glam to low key and secret, you can sip your favorite cocktails at some of the best speakeasies in North Carolina. 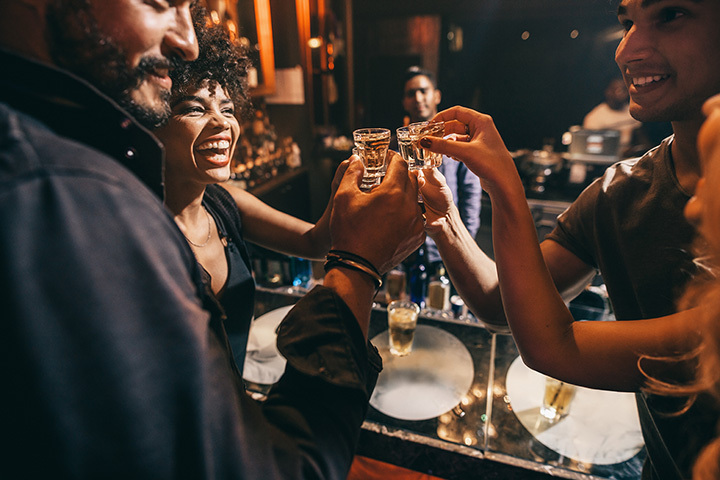 Proudly proclaiming themselves the best dive bar in town, the Speakeasy Tavern has friendly bartenders that are accommodating for all cocktail tastes. The expansive menu features food as well as drinks and it’s open every day of the year so that you can stop in for a drink anytime. The Conundrum allows kids during certain hours, but after 7:30 p.m. it’s time for adults to play. The Conundrum offers an escape room as well as speakeasy, open during select times. Shimmy your way past the glowing red light for cocktails that hail back to the days of prohibition and check out the live entertainment. Hidden inside the Belfast Mill, the Cotton Room offers a menu filled with creative cocktails designed for all tastes. Perfect for casual beers or after dinner drinks, the accommodating staff can find something for everyone. Some nights feature a DJ spinning tunes for further ambience. Strongly influenced by 1920s speakeasy culture, Barreled is located in the unassuming modern Lift shopping center. Barreled at the Lift takes its name from the barrels that once held illicit liquor and today creates cocktails, parties and more adult fun for any occasion. Filled with the ambience of a classic jazz bar, C. Grace offers live shows on weekends, so be prepared for a minimal cover charge. The bar is devoted to classic cocktail culture, but you can also find a few modern favorites, thanks to courteous bartenders. Located in Uptown Charlotte, Prohibition offers daily specials as well as special events. Check out the website for details before you head over for a late night on the town. The space can get crowded so be aware if you’re seeking more of a cozy watering hole than a party. The Blind Barbour is serious about whiskey. But you can find a lot of other boozy offerings as well. Open every night of the week, the Blind Barbour frequently hosts tastings and other special events perfect for refining your palate or finding a new favorite libation. The Crow & Quill has live entertainment, frequently of the jazz or classical nature, which pairs well with the old-timey atmosphere. Fans love the seasonally available specialty drinks as well as the vast selection of spirits and whiskey. You may spot people dressed to match the 1920s décor, so feel free to get your Gatsby on. The dimly lit downstairs bar in downtown Raleigh doesn’t have a lot of signage but it does have great cocktails. There’s no kitchen, so plan to sip instead on a variety of classic cocktails or have the well-trained mixologists create a bespoke beverage according to your personal tastes. A secret spot tucked into an alley and marked by an elephant, The Blind Elephant is a unique cocktail experience in Wilmington. You can find cocktails on tap and cocktails blended with liquors you may have never tried before. Many locals love it because you can go multiple times without trying the same thing twice and it hasn’t yet become a tourist destination.